On my recent trip to Zurich to speak at TEDxZurich I was arranging an interview with a journalist for the Swiss paper Tages Anzeiger. 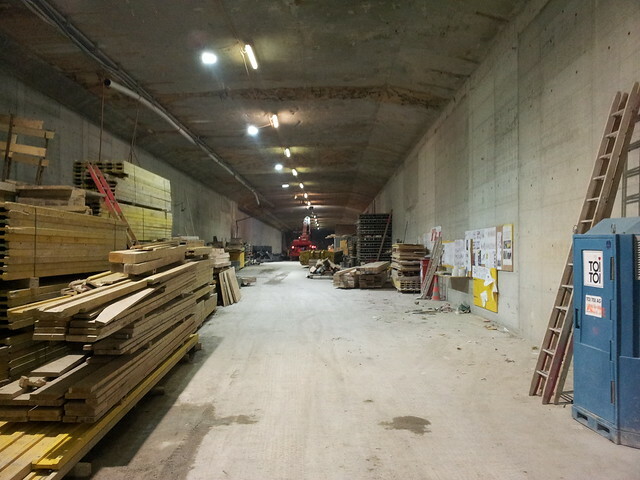 I had heard about the motorway tunnel built 20 years ago under the Central Station and asked him if we could visit it. He arranged it and, after a bicycle ride around the city to assess - and mock - the state of the city's bicycle culture, we headed underground, accompanied by two gents from Swiss railways. The tunnel isn't long. It was built two decades ago during the construction of the Museumstrasse line station. It wasn't even intended for immediate use. The plan was that it would eventually be used to connect the A3 and A1 - Allmend Brunau and Neugut motorway junction. I wanted to see the tunnel for two reasons. Firstly, it's just cool to see motorways and tunnels like this that have never been used. Never putrified with exhaust, its walls never shaken incessently by automobile traffic. I also wanted to visit it because I heard that the City of Zurich has plans to use it temporarily as a bicycle route to help get bicycle users past the nightmarishly engineered traffic around the Central Station. Between Kasernenstrasse and Sihlquai. 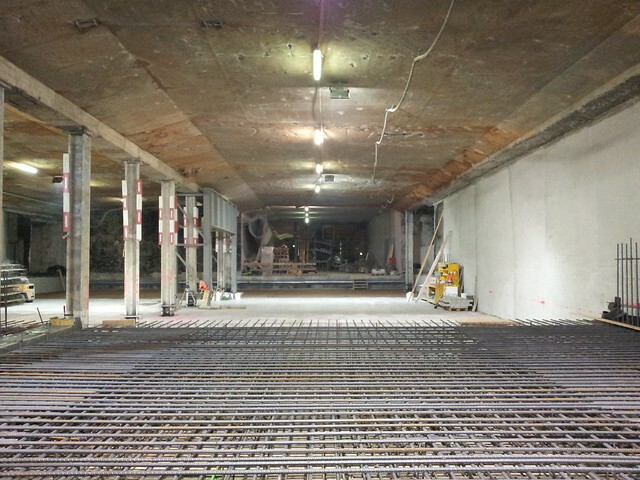 In addition, they want to provide bicycle parking for over 1000 bicycles, with access to the station and the new tracks currently under construction beneath the motorway tunnel. Bicycle users - or anyone really - shouldn't be herded underground. They should be given safe, separated infrastructure on street level. But if this Monument to Over-funded Engineers is just sitting there, unused, then why not. There is no clear answer about whether the tunnel will be used for the bicycle solution. The idea is far-advanced but no definite call has been made. 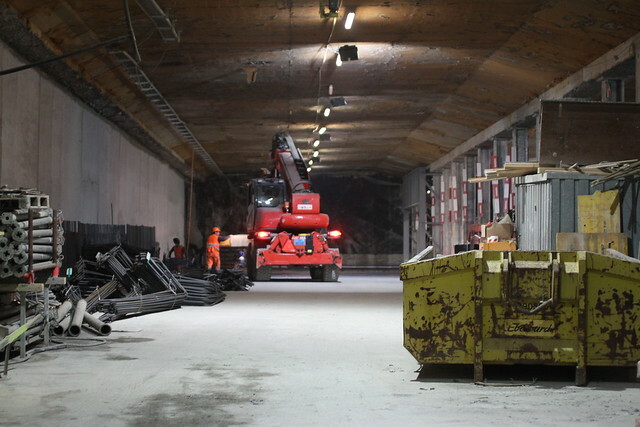 The idea is that it would be finished when the four new tracks beneath are finished in 2014. The temporary nature is because the City still - here in 2012 - plans to open the motorway connection in 20-30 years. Seriously. At that point I should hope cities had modernised enough so as not to need motorway connections beneath them or near them. The human brain works in odd ways. When I was standing below ground in the tunnel, I was reminded of one of the most poignant monuments I have ever seen - and that has ever moved me. A simple glass window embedded in the cobblestones in the middle of Bebelplatz in Berlin. This is where Goebbels orchestrated the 1933 book burnings of literature that was deemed un-German and a threat to German values. The monument by Micha Ullman from 1995 is so very moving in its simplicity. Peer down through the glass window and you see white, empty bookshelves stretching away under the square. Bookshelf space for the books that were burned. Turn the Zurich tunnel into a bicycle route and parking. Fine. Use one side of the tunnel for that. But what about erecting a permanent monument to the destructive 100 year reign of Automobile Culture on the other side? Get children and adults alike from around the world to send a toy car and then stack them in the tunnel. One for every life lost to automobiles over the past 100 years. You'll need a couple of million toy cars, but that's what would make it brilliant, poignant and a powerful, symbolic monument for future generations. It would be in Switzerland, as well. A nation that prides itself on being home to global organisations dedicated to helping people. Hey... Maybe we should just all start sending toy cars to the City of Zurich? Telling them to please put them in the memorial under the train station? I'd like the plaque at the entrance to use my quote at the beginning of the interview with the paper... in the caption below the photo.